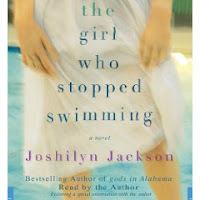 A book that has been getting a lot of "buzz" in library/book catalogs lately is The Girl Who Stopped Swimming by Joshilyn Jackson. The descriptions sounded intriguing. A woman who sees ghosts is visited in her bedroom one night by a drowned girl. When the woman, Laurel, looks out her window, she can see a girl's body floating in her backyard pool. You'd think, from that description, that the book would be mostly about ghosts, or solving the murder mystery (because, hey, there was surely foul play involved, right?). This book, however, is a bit all over the place. Laurel has an estranged, outrageous older sister named Thalia. Naturally, when Laurel is confronted with the dead girl in the swimming pool, the first thing she needs to do is drag the sister she hasn't spoken to in two years into the action. (?) Laurel's husband, a software developer, spends most of his time in the secluded in the basement and communicates in monosyllables. Naturally, he and the sister-in-law-from-hell can't stand each other. Laurel also has a teen aged daughter, Shelby, who was best friends with the dead girl. To further complicate matters, Laurel's family is from an impoverished Alabama town called DeLop. Laurel likes to play the "lady of the manor" by occasionally descending on DeLop with gifts for the poor underprivileged who live there, and by allowing one of the town's children, a girl called Bet Clemmons, to stay at her house. Oh, someone please nominate Laurel for sainthood! There are plenty of flashbacks to a mystery involving Laurel's uncle, who was killed in a hunting "accident" when she and Thalia were girls. There's also conflict between Laurel and her husband, her sister, her daughter, her parents, etc. and long, drawn-out descriptions of the quilts that Laurel makes and sells for five figures. The book is filled with many, many unbelievable and ridiculous situations (the one where the young child *volunteers* to go off with a man who had previously attempted to molest her tops the list). Many eye rolls and exasperated sighs later, I managed to finish listening to the audio version of the book. The story was just too all-over-the-place to be good. The ghost child makes only the one appearance, which was a waste, and the over-the-top sister was a bit too grating. We are supposed to gain some sympathy for her by the end, but she was too difficult to endure. The only good thing about the audio book was that it was read by the author Joshilyn Jackson. She did a fantastic job! I listen to many, many audio books, and she ranks right up there with the professional actors. All the characters had distinct, appropriate voices, and there was a lot of emotion in her delivery. Unfortunately, she just didn't have a very good story to work with. At the end of the audio book there was an interview with the author where she stated that she often gets an image or an idea and then later builds a story around it. That was very apparent with this story -- it just didn't seem to hang together very well or to have a firm focus.